Big news for people who love big news: Bon Iver has dropped the tracklist, title, and release date for his next record. Change your pants and meet us after the jump. Devotees may recall we freaked out about this earlier, and again. The self-titled effort is due June 21st on Jagjaguwar. The very geo-centric tracklist and a new, worthwhile bio penned by Michael Perry below. First it was For Emma, Forever Ago. The soul in a refraction of icicles. A moment hanging like breath on air. And yet life even still life is not still. The story is not a story if it does not unravel. Your eyes you may cast backward, but the heart is locked in the chest and must beat forever forward. 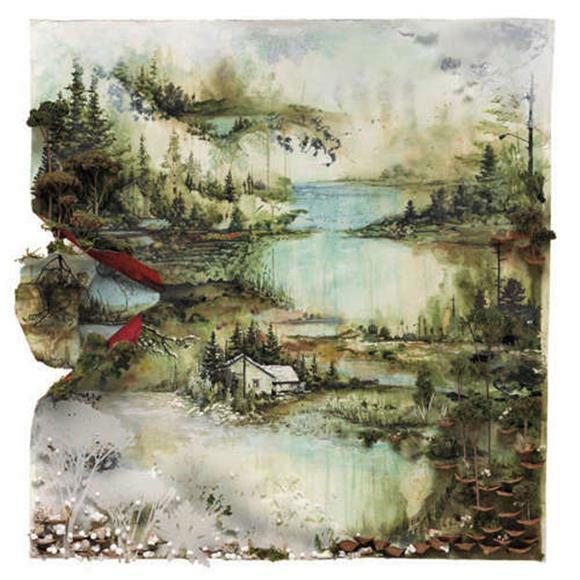 Bon Iver, Bon Iver is the frozen beast pressing upward from a loosening earth, one ear cocked to the echo of the ghost choir still singing, the other craving the martial call of drums tumbling, of thrum and wheeze. The desolation smoke has dissipated, cut with strips of brass. Celebration will not be denied, the cabinet cannot contain the rattle, there is meat on the bones. It's there right away, in the thicker-stringed guitar and military snare of "Perth," and "Minnesota, WI." Anyone who had a single listen to For Emma will peg Justin Vernon's vocals immediately, but there is a sturdiness an insistence to Bon Iver, Bon Iver that allows him to escape the cabin in the woods without burning it to the ground. "Holocene" opens with simple finger-picking. The vocal is regret spun hollow and strung on a wire. Then the snare-beat breaks and drives us forward and up and up until we fly silent through the black-star night, our wreckage in view whole atmospheres below. The vocals in "Hinnom, TX" ease to the muffled depths, while the instrumentation remains sparse and cosmic. "Calgary" is a worship song to everything For Emma mourned, and at the point in the final track "Beth/Rest" when Vernon sings, "I ain't livin' in the dark no more" it is clear he isn't dancing in the sunshine, but rather shading toward a new light. "Bon Iver is often equated with just me," says Vernon, "but you are who surrounds you, and for Bon Iver, Bon Iver I wanted to invite those voices as musical catalysts." Thus on the track "Beth/Rest" and throughout the album, we hear the pedal steel of Greg Leisz (Lucinda Williams, Bill Frisell), the uniquely layered low end of Colin Stetson's (Tom Waits, Arcade Fire) saxophones, the riffing of Mike Lewis' (Happy Apple, Andrew Bird) altos and tenors, and the lush horns of C.J. Camerieri (Rufus Wainwright, Sufjan Stevens). Bon Iver regulars Sean Carey, Mike Noyce and Matt McCaughan contributed vocals, drums and production, Rob Moose (Antony and the Johnsons, The National) helped with arranging and added strings, and fellow members of Volcano Choir, Jim Schoenecker and Tom Wincek provided processing. Bon Iver, Bon Iver was recorded and mixed at April Base Studios, a remodeled veterinarian's clinic located in rural Fall Creek, Wisconsin. The main recording space is constructed over a defunct indoor pool attached to the clinic. "It's an unique space and destination; it's our home out here," says Vernon, who purchased the structure with his brother in late 2008 with the sole intention of converting it into his ideal recording studio. "It's been a wonderful freedom, working in a place we built. It's also only three miles from the house I grew up in, and just ten minutes from the bar where my parents met." The creation of Bon Iver, Bon Iver was a three-year process, and Vernon says the completion of the studio paralleled the completion of the album. "I was writing and recording in the windows of time snatched between tours in support of For Emma," he says. "When I finally came home to hunker down for a solid stretch there was a feeling of solid ground and an opportunity for liberation waiting in the space for me." In the absence of solid ground, the whirlwind becomes a whirlpool, and Bon Iver, Bon Iver is Justin Vernon returning to former haunts with a new spirit. The reprises are there solitude, quietude, hope and desperation compressed but always a rhythm arises, a pulse vivified by gratitude and grace notes, some as bright as a bicycle bell. The winter, the legend, has faded to just that, and this is the new momentary present. The icicles have dropped, rising up again as grass.